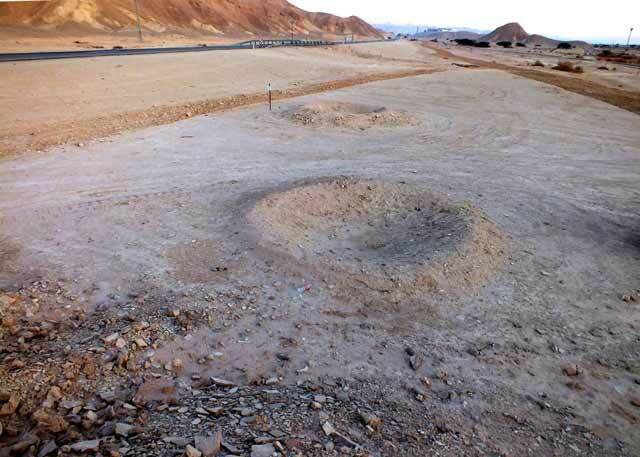 In December 2011, an excavation was conducted along the eastern margin of Highway 90, c. 1.5 km north of Yotvata Park (Permit No. A-6250; map ref. 20590–5/42482–96; Fig. 1), prior to widening the road. The excavation, undertaken on behalf of the Israel Antiquities Authority and financed by the National Roads Company of Israel, was directed by Y. Haimi, with the assistance of Y. Al-ʽAmor (administration) and S. Gal (GPS). 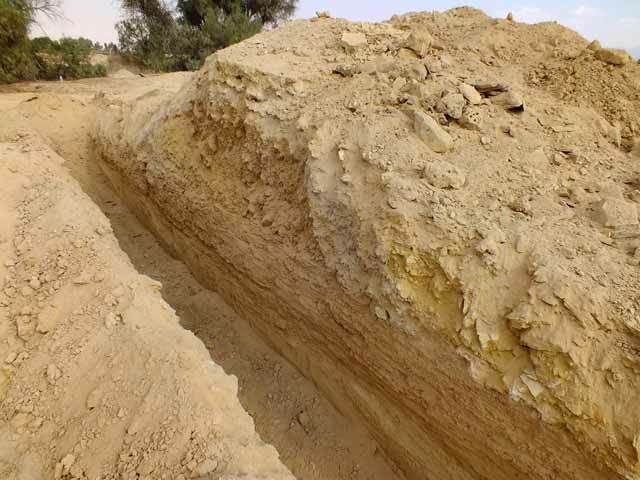 Five trial trenches (sections; 50 sq m) were opened with a backhoe near the earthen embankments of an ancient square pool (c. 25 × 25 m); in addition, a previously dug trench in the pool’s northern embankment (Meshel 1990:33) was cleaned. The pool was constructed on the alluvial fan of Nahal Shaharut, on the northern bank of the stream. The pool was identified in the early 1930s, when Frank (1934), a German researcher, performed the first detailed survey of the ʽArava. A breach in the eastern part of the southern embankment emptied the pool’s water into a drainage channel that extended southward, conveying flood water from the mountains in the northwest to the Yotvata salt-flats. Porath (2016:38*–39*) ascribed this channel to System A, one of seven tunnel-well systems (qanat; A–G) in the area. 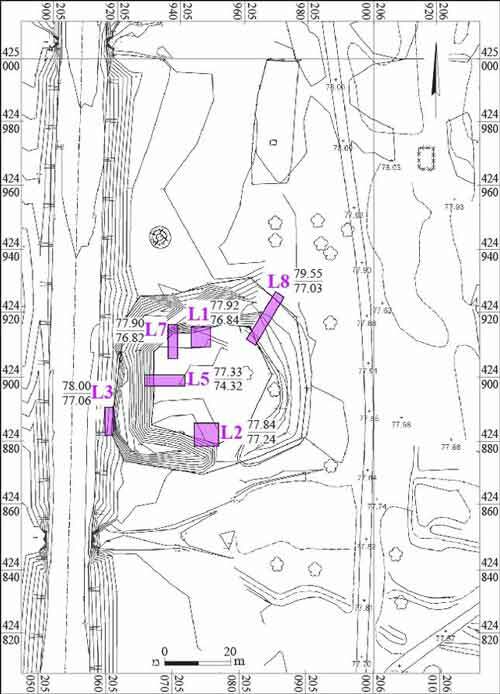 Tunnel-well A, which is situated slightly north of the pool, was surveyed by Frank (Fig. 2; Porath 2016:40*). Wells of this type were characteristic of the Islamic period, but can be still found today, mostly in Iran, Jordan and Morocco (Meshel 1990:33). Tunnel-wells are a method for conveying groundwater or rainwater by means of gravity through a gently sloping channel or tunnel, a method that is usually suitable for arid regions (Porath 2016:1*–2*). The location of the wells can be identified by rings of earth (‘plates’; diam. c. 3 m; Fig. 3) that were formed while excavating the wells—shafts used for maintaining the tunnels and cleaning the silt that accumulated in them. The wells in the Yotvata area were installed in two rows along the tunnels that extend from north to south, toward the pool. Two ‘plates’, belonging to two different lines of wells, are located inside the pool, near the northern embankment; thus, it is clear that the two tunnels, connected to two lines of tunnel-wells, ran under the embankment. The tunnels evidently conveyed water toward agricultural areas. In the 1980s, Porath opened a trial trench in the northern embankment of the pool, as it was thought that the pool was the main well in a system of tunnel-wells; it was therefore referred to as the ‘mother well’. Porath suggested that the two System A tunnels (A4, A5) served to fill the pool. In his opinion, this system was installed during the Islamic period (Porath 2016:77*, Note 36). The current excavation, undertaken due to a concern that the pool’s western embankment and Tunnel-Well System A would be damaged, sought to determine the function of the pool and whether it was contemporaneous with the tunnel-wells. 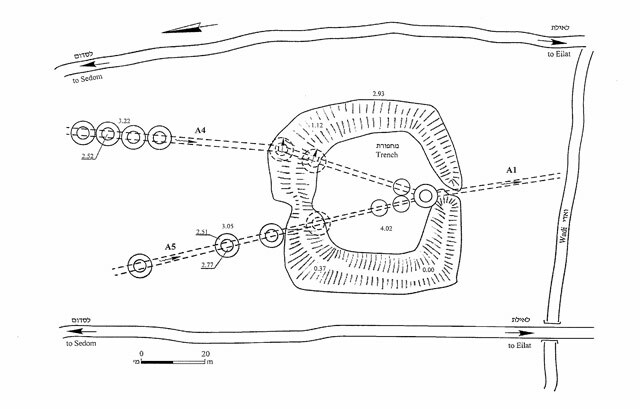 With this aim in mind, five trial trenches (sections) of various sizes (L1–L3, L5, L7) were dug inside the pool, and the trench excavated by Porath in the 1980s was cleaned (L8; Fig. 4). Section L1 (3 × 3 m, depth 0.6 m) was opened alongside the northern embankment of the pool. The eastern part of a ‘plate’ and a portion of the northern embankment were excavated in order to determine the stratigraphic relationship between the pool’s embankment and the wells. The ‘plate’ was piled on a layer of clean loess. An examination of the northern part of the section showed that the ‘plate’ rested on the layers comprising the embankment (Fig. 5), evidence that they postdate it. Section L2 (3 × 3 m, depth 0.5 m) was opened beside the southern embankment of the pool, alongside the breach in that embankment. The section revealed that the embankment was constructed on a layer of clean loess. 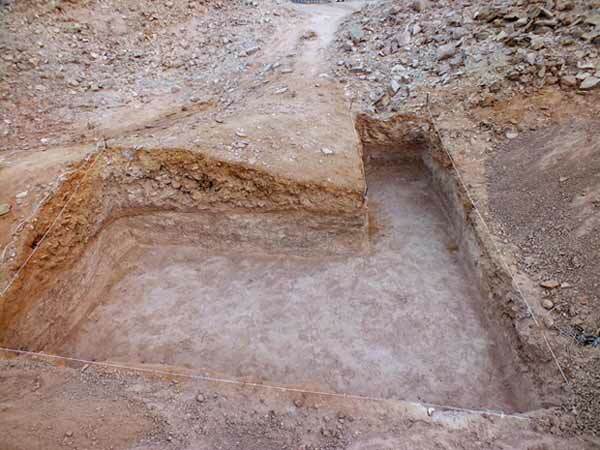 Section L3 (1 × 3 m, depth 1.1 m) was excavated outside the pool, between Highway 90 and the western embankment. 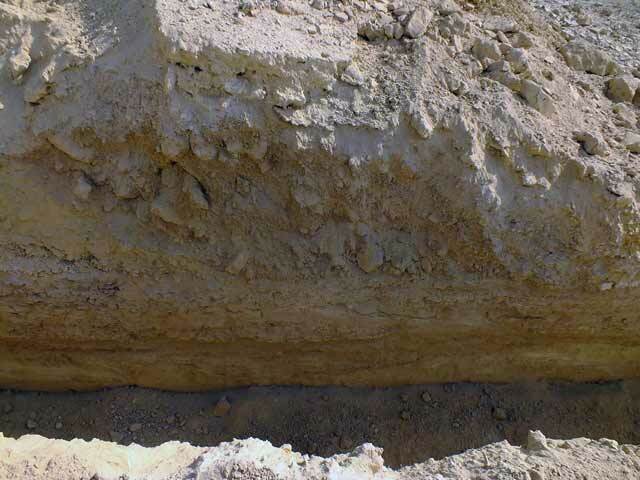 The section unearthed a layer of loess (thickness 0.4 m) that covered layers of the fluvial deposition of Nahal Shaharot. Section L5 (1.2 × 4.0 m, depth 3 m) was excavated adjacent to the eastern side of the western embankment (Fig. 4). A sequence of layers was exposed beneath the embankment: loess (thickness 0.8 m), a layer of fluvial deposition of Nahal Shaharot (thickness 0.8 m) and a layer (thickness 1.4 m) of clay and gypsum at the bottom, indicating that standing water formed a salt flat (Fig. 6). 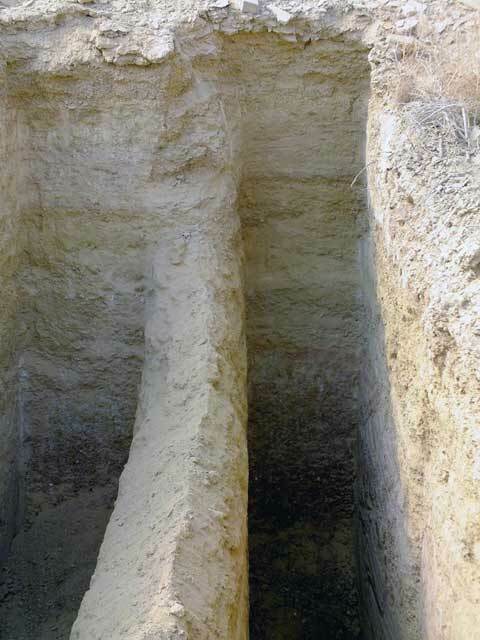 The layer of loess was thinner (0.15 m) on the eastern side of the trench because it was dug out when the pool was constructed. Fluvial depositions of Nahal Shaharot containing fossil shells (Fig. 7) could be discerned under the loess layer. Section L7 (1 × 5, depth 1.2 m) was opened beside the northern embankment, west of Section L1, but it continued southward, beyond Section L1. The section was intended to examine the relationship between the embankment and one of the two ‘plates’ within the pool. It was apparent in the section that the embankment was founded on a thick layer of loess (thickness 0.5 m), whereas the ‘plate’ was formed on a thinner layer of loess (0.1 m). This stratigraphic relationship indicates that the ‘plate’ is later than the pool (Fig. 8), as its the installers dug into the natural loess and dumped the earth on top of the pool’s embankment. Section L8 (length 7 m, width 1 m). This is the trench excavated by Porath in the 1980s. It was cleaned, revealing that the embankment had a core consists of stones and soil and was lined with stone slabs, fragments of which were visible on top of the embankment (Fig. 9). The southern part of the trench revealed that the soil comprising the second ‘plate’ found within the pool was piled on the margins of the embankment (Fig. 10), proving beyond any doubt that the tunnel-wells postdate the pool. The results of the excavation indicate that the pool predates the system of tunnel-wells; the pool may have very well been out of use by the time the tunnel-wells were dug. Porath dated the wells to the Early Islamic period (seventh century CE; Porath 2016:77*, Note 36). Several Melanopsis shells (Fig. 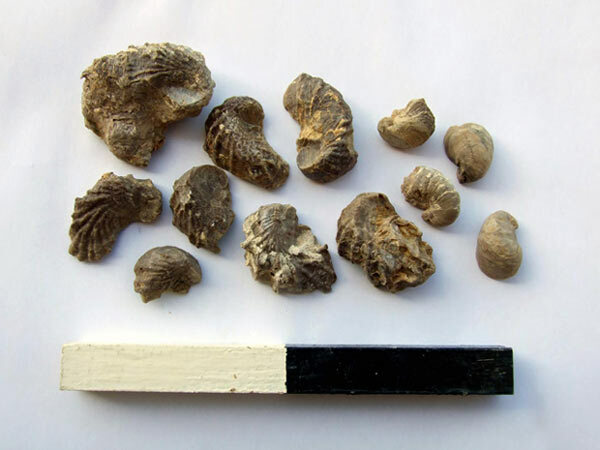 11) were found on the western embankment, evidence of freshwater; however, since no other Melanopsis shells were found in the excavation, it is impossible to know where the shells originated, whether in the pool or in the tunnel-wells. No finds that can aid in dating the pool or the string of wells were discovered in the excavation, and thus there is no way of confirming or refuting the dating proposed by Porath. Frank F. 1934. Aus der ‘Araba I: Reiseberichte. ZDPV 57:91–280. Meshel Z. 1990. Neve Yotvata: Its History, Landscape and Sites. Jerusalem (Hebrew). Porath Y. 1987. Qanats in the ‘Aravah. Qadmoniot 79–80:106–114 (Hebrew). Porath Y. 2016. Tunnel-Well (Qanat) Systems from the Early Islamic Period in the ‘Arava. ʽAtiqot 86:1*–81* (Hebrew; English sumary, pp. 113–116). 2. 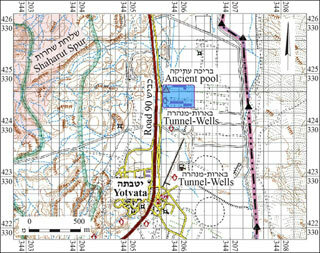 The pool and the tunnel-wells in the area of Yotvata (Porath 2016:40*). 3. ‘Plates’ of a tunnel-well system, looking north. 4. The pool, plan and sections. 5. Section L1, looking north. 6. Section L5, looking west. 7. 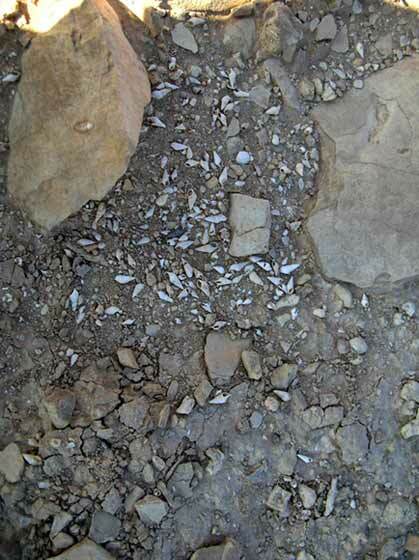 Fossil shells in the fluvial deposition of Nahal Shaharot at the bottom of Section L5. 8. Section L7, looking northwest. 9. Section L 8, the core of the embankment, looking northeast. 10. Section L8, the piled earth of a tunnel-well shaft (‘plate’) on the embankment, looking east.